What a difference a season makes - this year straight in at 8.15 am and straight down the river and out to sea for a days trip to Blue Anchor and Minehead ! And a pretty unsettled sea with the recent Easterlies - but it had veered a bit to the east and dropped to a 4 - but the forcast was stil 4-5 with 6 later in west. I was a bit apprehensive - but acheived a great deal by going for it.That was the new year resolution - stop thinking about it - do it ! 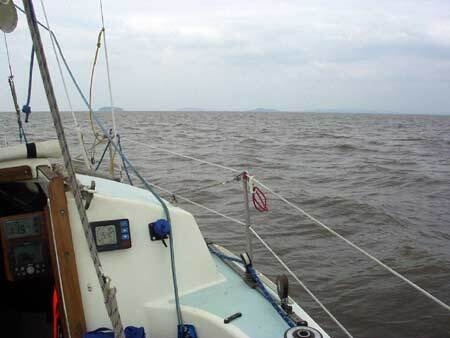 Was in Blue Anchor Bay by 12.00 - just on the jib, not even a tack, courtesy of Bristol Chanel tidal escalator going at some 4 kts. Turned early - the sea had an eerie anger in it somehow - despite not really too big a swell but a constant small chop. Conditions were terrible Sunday, with a strong NE into the spring funnelling up the Channel - worst some had seen for while. So I never really relaxed - but enjoyed all the same. Unusual light too - with the sun in and out - oscillating between a warm friendly yellow blanket one minute to a evil looking dark chop the next. Nice new deck paint ! -Biscay blue. Taken the sprayhood off this season. Much nicer without it - andI now have the roll down cover on the hatch with its pvc window so's I can still see the instruments. Odd to see the mud like this - its deep here - twenty metres - shows how this sea has been the last few days. Never seen mud in the water here before. The island is a bird sactuary - and you can arrange to stay on it in spartan 'camping' conditions in the old buildings. Once past here - when Flat Holm light, hidden here behind Steep Holm, lines up with Uphill Church - thats more or less the approach line to turn in for Weston Bay. 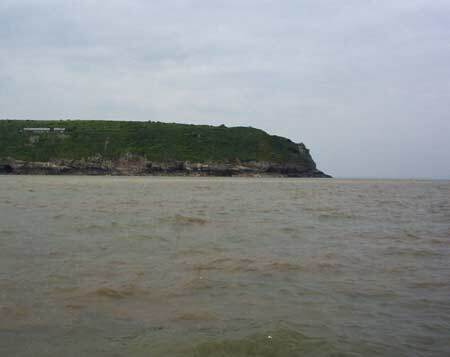 You keep well clear of the end of BreanDown - which is opposite Steep Holm - before Weston Bay. On the skyline - Anchor Head to left, end of Brean Down to right - a bit of sun shining on the delights of Weston s Mare in the middle. 90 deg east of my ground track. Because I was pottering in - on the engine, I had a chance to really see what was going on - ie my boat heading, gps track - some eye sightings on the pierhead/headland. 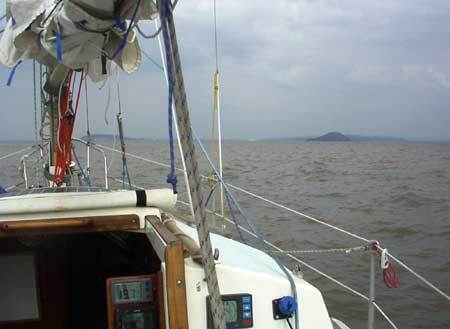 It was really quite unbelievable - but I was only doing 2.5 kts at the time in a tide doing 4kts. Pointless to speed up as I could not get up the Axe any earlier than 2 1/2 before - and if I did I would be getting up to the mooring in virtually no water. Bit of a fight to moor up - always a problem on your own early on the rising tide - out of practice ! Nice still night - dead quiet, apart from the blasted ducks - but it is a nature reserve I suppose ! Bit of a heel on the mud - about 15 deg. Very nice Shippans tinned curry ( and for someone who has made his own curries since he was 14 - that IS saying something - £2 a tin though ! ) I did have it with my own made Basmati I bought with me frozen. Choc tart and creme fraiche as well - yummy. Brie for afters - can't be bad. Got the food about right - just had a bit of bread and fruit left and a very ripe bit of brie. The curry was 'boat stock' - I seldom eat tinned stuff - but they are great for keeping aboard. I shall buy some more of these. I try to take decent food frozen with me. Frozen bacon, eggs and pre boiled potatoes are good - frozen good sausages ( the Black Friar ) frozen curries ( mine) roast lamb in gravy. Its a good idea as it keeps the other stuff cool. I keep a cool box on the boat - so stuff it all in there as soon as I get aboard - or I can put things in a bin liner in the lower bilge, though the access hatch. Really cool in there, next to the under water hull - if its super warm, or if I'm going to be aboard for more than a few days. Hopefully this summer will see some extended cruising - I've started right. Had a lot of stuff to sort out aboard - but generally I like staying on the mooring - especially after sailing. So much more relaxing than suddenly driving on the motorway - an hour after you have been on the water. A promising - if tiring, start to the new season.